Explore the island archipelago of Spitsbergen on board an ice-strengthened expedition cruise boat. Reach places that other ships cannot, and enjoy a varied mix of experiences both on land and at sea. 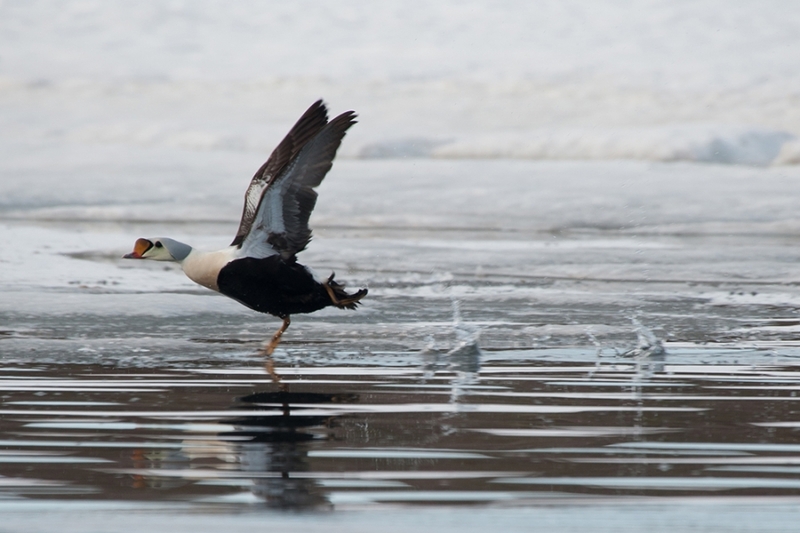 During the summer months Svalbard is home to an abundance of wildlife which includes the elusive polar bear, sea birds, reindeer, whale and seals. 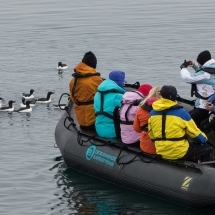 Your 10 day expedition offers an up-close chance to witness wildlife in their natural habitat and to admire scenery which serves as a reminder of your proximity to the North Pole. The circumnavigation of the islands is weather-dependent and the itinerary may vary to that oulined according to weather and ice conditions. Flexibility is essential when joining this trip. Arrival in Longyearbyen, according to your flight time. 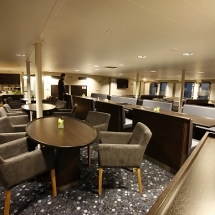 If you wish to arrive the day before the ship departs, we can arrange accommodation for you. 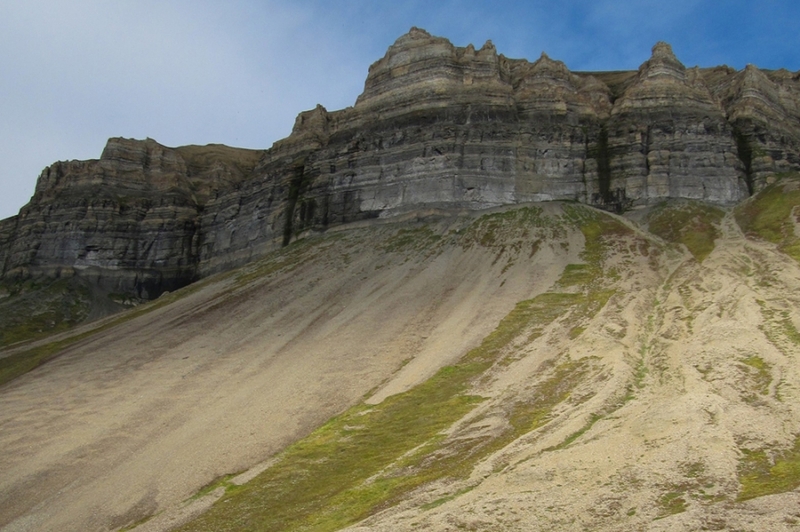 Your ship will be ready for boarding later in the day so you’ll have time to explore the former mining town of Longyearbyen with our recommendations for local sights and restaurants. 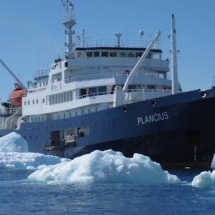 In the early evening, it is time to board your ship M/V Plancius - a vessel hardened to the ice fjords of Spitsbergen and offering a comfortable base to enjoy the scenery and wildlife. 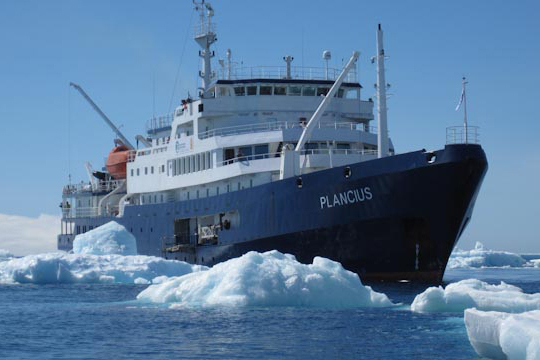 By night M/V Plancius will be making her way along the scenic west coast arriving to Krossjord by morning. Here you’ll swap ship for Zodiac boat where you’ll enjoy a close-up cruise in front of the Glacier 14th of July. The green slopes will reveal colourful flowers and nesting birds including Kittiwakes and Brünnichs. You may also spot Arctic foxes patrolling the base of the cliffs looking for their next feed, or perhaps a Bearded Seal bobbing up and down in the fjord. In the afternoon you’ll continue by the ship to Ny Ålesund - the world’s most northerly settlement, also a former mining village turned research centre. Near the village you’ll find a breeding ground for Barnacle Goose, Pink-footed Goose and the Arctic Tern. It is here that you’ll also discover the history of Arctic exploration symbolised by the anchoring mast used by Amundsen and Nobile before their airship flights to the North Pole in 1926 and 1928. Today begins with a walk on the tundra island of Andøya close to the mouth of the Liefdefjorden. 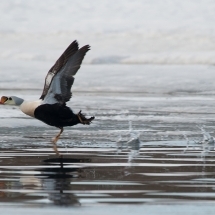 Many common eider and Pink-footed Goose nest in the area, and the more rare King Eider may be seen as well. 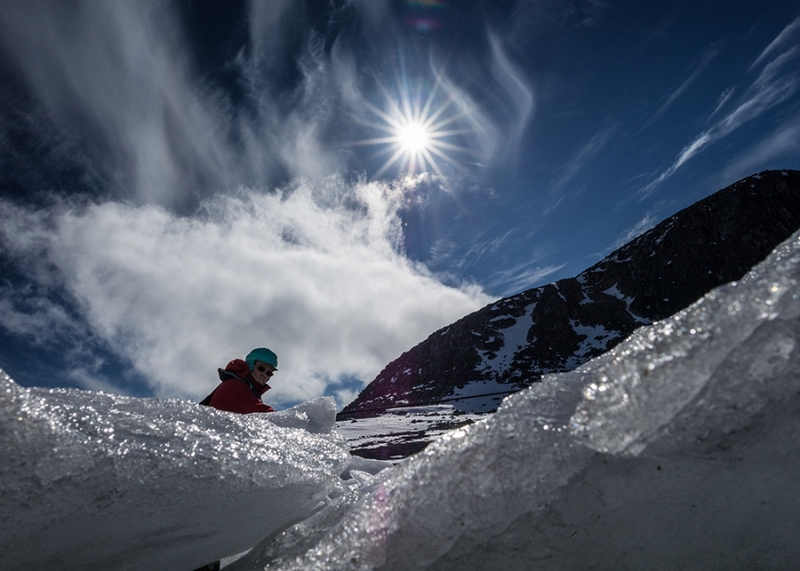 The ship will then cruise to Liefdefjorden near to the face of the impressive Monaco Glacier - a popular gathering place for Kittiwakes and the odd Polar Bear. 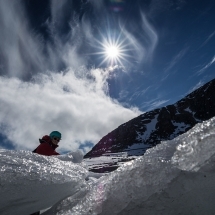 Your trip reaches its northernmost landing place in Phippsøya - a staggering latitude of 81 degrees north and just 540 miles from the North Pole. This area is inhabited by polar bear, walrus and Ivory Gull. 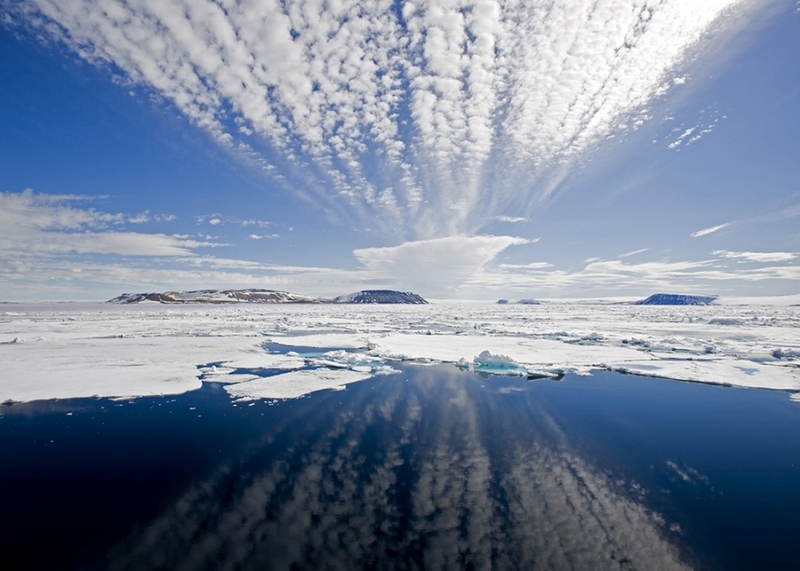 There will be plenty of time for gazing at the surrounding pack ice and wildlife. The programme will then either continue further into the sea ice (usually in August) or alternatively continue to the Sorg Fjord where you may encounter a herd of walrus near to the graves of 17th century whalers. A short nature walk will provide a further opportunity to encounter families of Ptarmigans. Your trip continues either in the sea ice or the Sorg Fjord depending on the conditions of the ice and weather during your trip. Today you’ll sail into Hinlopen Strait, home to Bearded Seal, Ringed Seal, Polar Bear, and Ivory Gull. 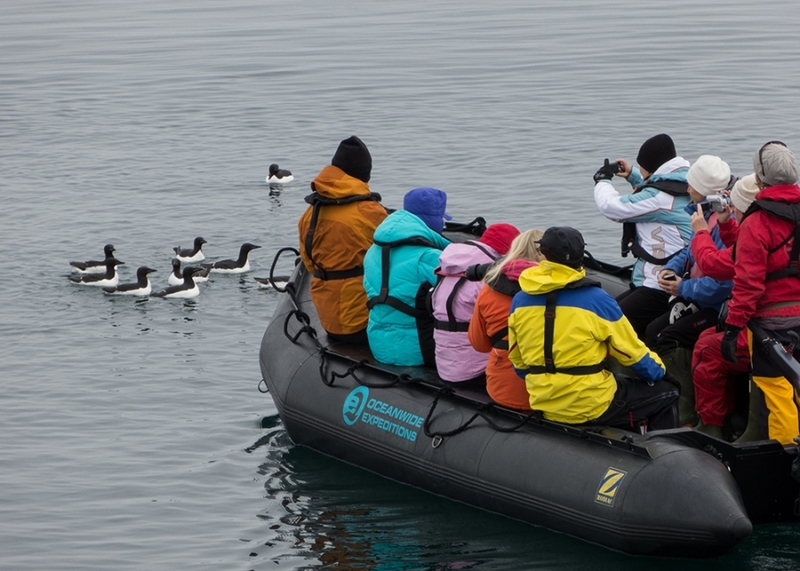 You’ll navigate the ice floes of Lomfjordshalvøya in Zodiac boats and explore the bird cliffs of Alkefjellet home to thousands of Brünnich’s Guillemot. On the east side of Hinlopen Strait your ship will attempt a landing at Augustabukta on Nordaustlandet, home to reindeer, Pink-footed Goose, breeding Ivory Gull, and Walrus. Landing on the island of Nordaustlandet brings you tantalisingly close to the edge of the world’s third largest ice cap which tumbles to the nearby shoreline. Enjoy a walk along the smooth rock formations which have been sculpted by the ocean waves over the centuries. Freemansundet is the sound dividing two islands named after Alderman Ralph Freeman, a 17th century English whaler. Here you’ll land on the barren and windswept island of Barentsøya. You’ll visit an old trapper’s hut and take a bracing walk across the tundra to spot Spitsbergen reindeer and Barnacle Goose. 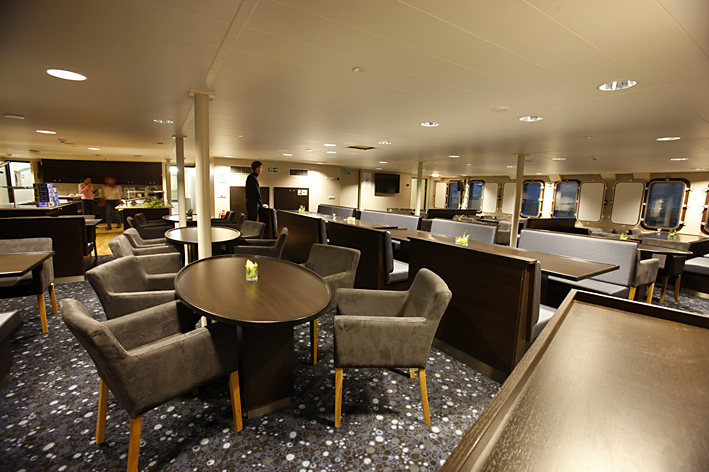 Your journey continues on board the ship to the western side of Edgeøya. After a Zodiac cruise through the shallow bay, you’ll land on a beach littered with whale bones and tree trunks that have found their way from Siberia. 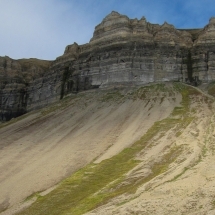 You can climb to the rim of a narrow gully inhabited by thousands of Kittiwake, together with Black Guillemot and piratical Glaucous Gull. During breeding season the base of the cliff is patrolled by Arctic Fox and Polar Bear, especially females with young cubs, looking for young birds that have fallen from the nesting ledges. Today all that remains between you and Greenland is a vast ocean as you cruise the southern fjord of Hornsund. 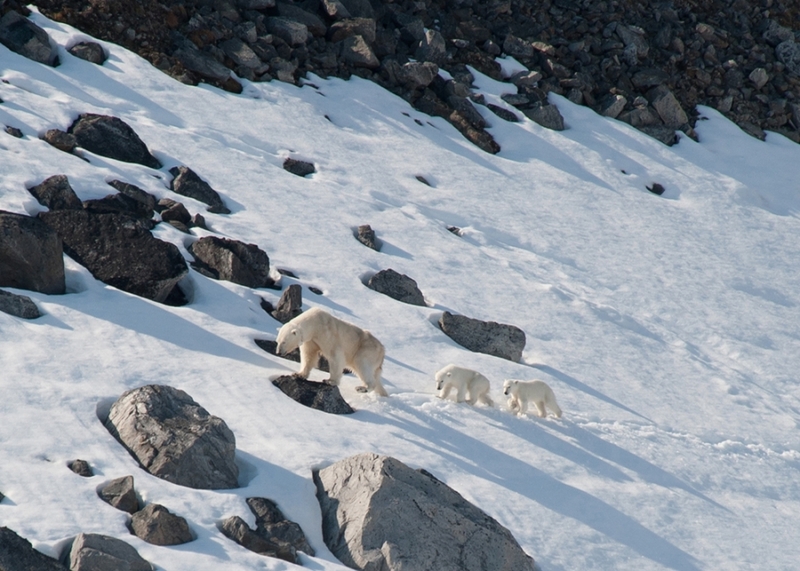 This spectacular mountain and glacier landscape brings a great chance to encounter seals and polar bear. Today’s adventure takes you to the island of Ahlstrandhalvøya at the mouth of Van Keulenfjorden. 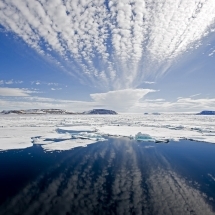 This is Beluga whale territory so you may be lucky and see a pod of whales before heading to Recherchefjorden in the afternoon to explore an area of tundra where many reindeer feed. Your voyage comes to a close on return to Longyearbyen where you’ll disembark and transfer to the airport for your return flight. 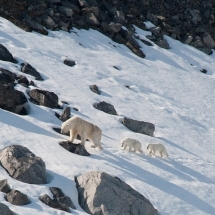 If you wish you can also extend your holiday in Spitsbergen with extra nights. From £3550 per person based on sharing a quadruple cabin with other passengers. 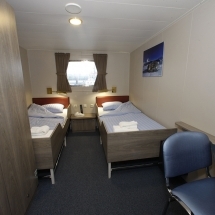 From £4700 per person based on two people sharing a private twin cabin. 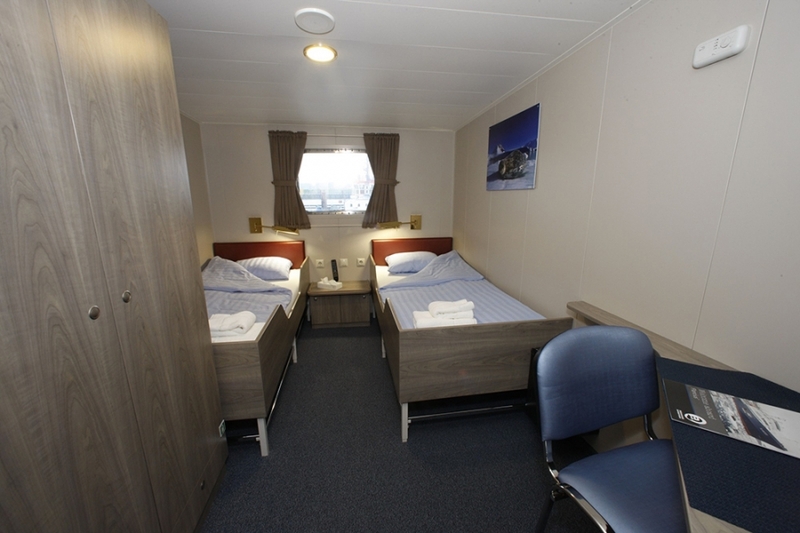 Please get in touch with us to find out prices and availability of cabin categories.